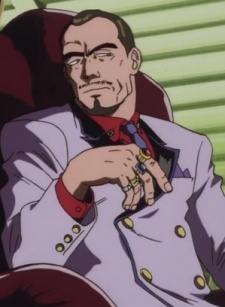 Gordon was a criminal casino owner who recruited Faye Valentine in an illegal business transaction that made use of her skill as a cheater and a gambler. The plan was to acquire a special chip (with the ability to decrypt and unlock virtually any security code) from one of the patrons in Gordon's casino, but the plan goes awry due to the intervention of Spike Spiegel. Gordon makes an arrangement with Spike and Jet Black to exchange the chip, currently in the hands of Spike and Jet, for 30 million Woolongs. Gordon and his henchmen intend to turn on them, but are quickly outwitted. As Faye escapes in her Redtail, Gordons men begin firing gunshots and rockets at the Redtail, but Faye reverses the polarity of the rockets, directing them back at Gordon, killing him and his men.